This dish is so healthy, delicious, and looks beautiful, everything required for a win in my book. 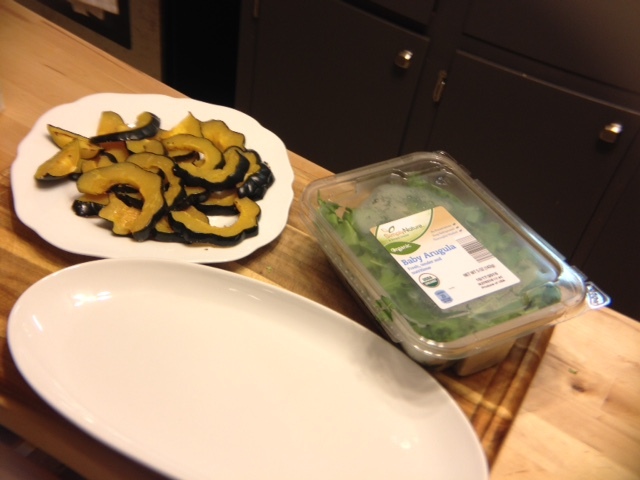 Although my mom totally did think I was making a salad with actual acorns and felt much better when she discovered it was squash and not the results of forging in the woods. My family thinks I am weird. I based this recipe off of the one made by Krista from Joyful Healthy Eats. Thanks Krista! One note about this recipe. The first time I made this recipe, I used a white acorn squash, the second time I made it with a regular, dark green acorn squash. I think they taste equally delicious, but the pictures are from both rounds of cooking. 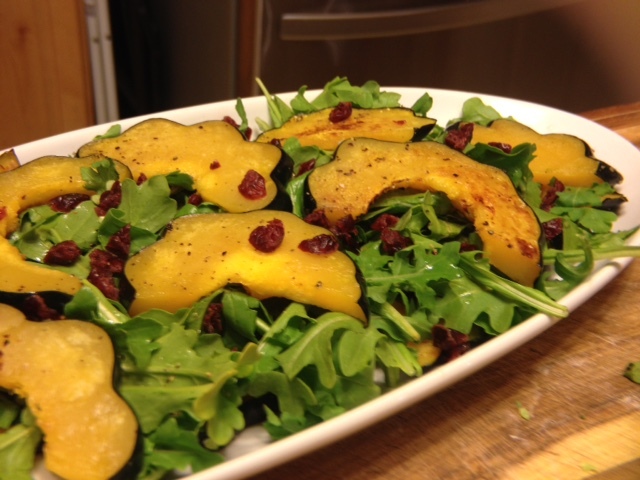 1 white acorn squash Note here: I used white acorn squash because it was pretty and I wanted to. 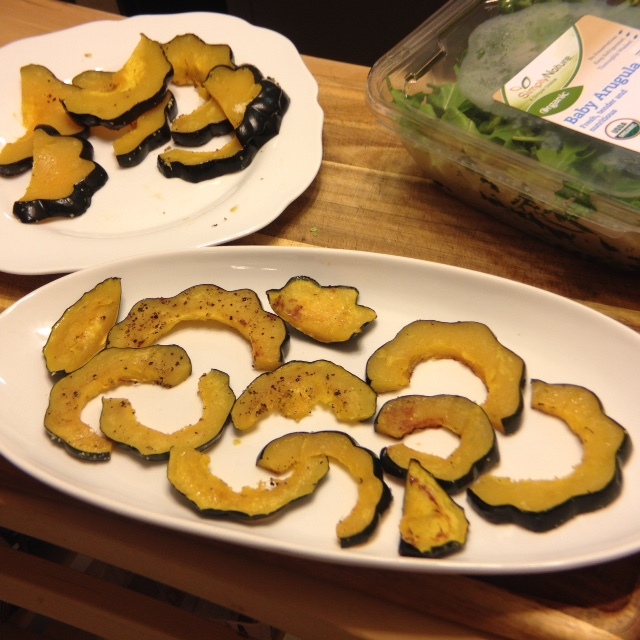 You absolutely can use the regular, dark skinned acorn squash. 2 tablespoons white balsamic, I used a pear infused white balsamic; white wine vinegar can also be substituted, but pair with 1 1/2 teaspoons maple syrup. 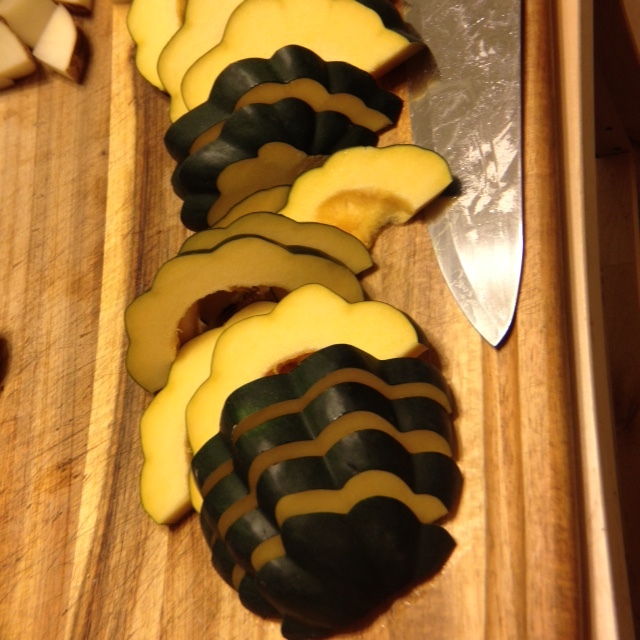 Cut the acorn squash in half, remove the seeds and guts, then slice into 1” half moons. Spray the cooking sheet with cooking spray. 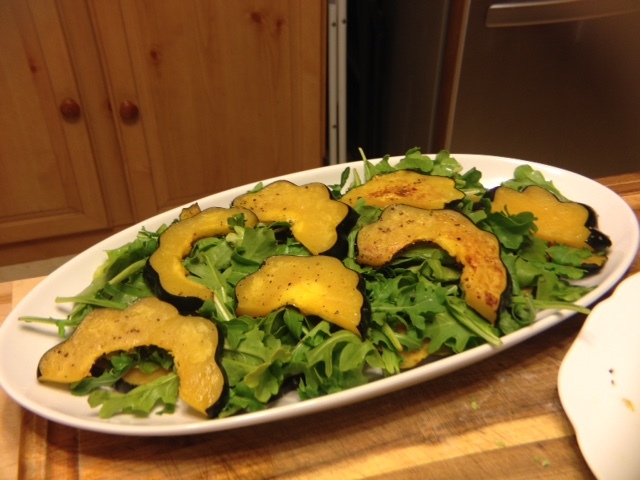 Place acorn squash on a baking sheet and spray the tops of the acorn squash with cooking spray. Lightly season with salt. I used sea salt. Bake for 10 minutes, turn the squash and allow to cook for another 10 -15 minutes. 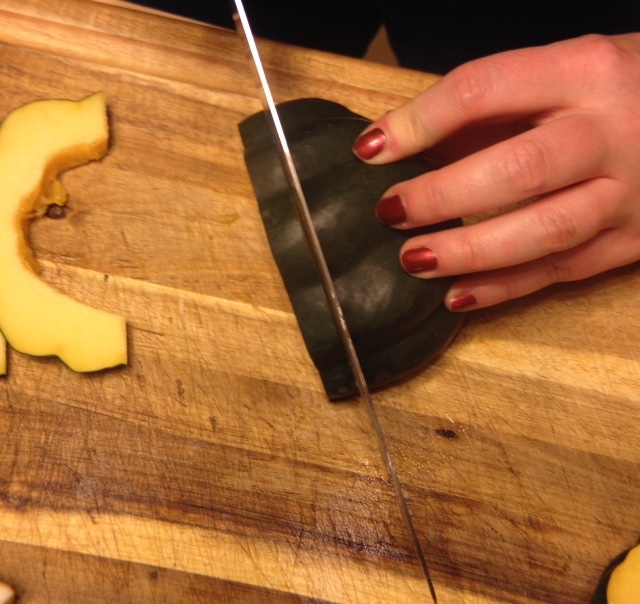 You want the squash to be very tender and gain a slightly golden color. In a small bowl, whisk together white balsamic or white wine vinegar and maple/agave syrup.You can add 1 tablespoon olive oil to make the dressing adhere better to the arugula, but I cut the calories by not adding it. 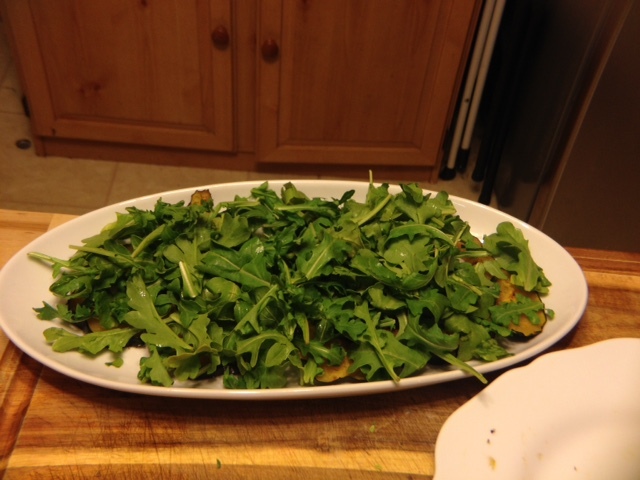 In a medium bowl add arugula and dressing. Lightly toss to coat. 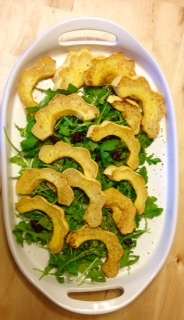 To plate, add together the arugula, squash, cranberries, and any cheese you decide to add. One time I added the squash to the top and once to the bottom. It doesn’t matter if the squash gets cold. 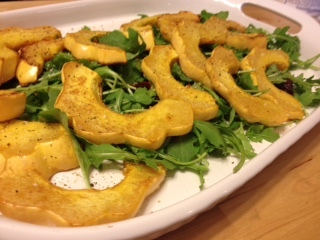 This dish is delicious with the acorn squash room temperature or with the squash hot. In the source recipe, she has you remove the skins before eat. I say nay to that. There is no reason to unless you just dislike the taste of the skin, plus it helps the squash keep that lovely safe. 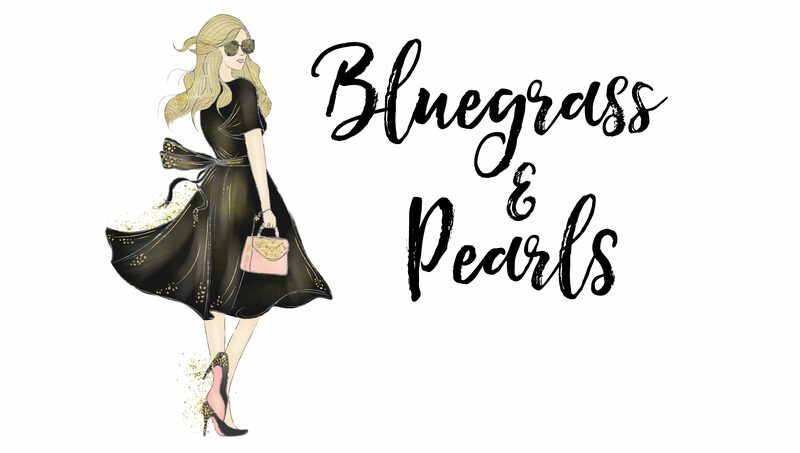 Embrace your laziness – eat the skin! A note regarding the dressing. When I am using an infused vinegar, I like to use agave syrup. With regular balsamic vinegar, I think maple syrup lends a nice, fall flavor. Next Post This is Halloween!